The L7 announced its return to the stage after a hiatus of nearly 15 years. The female quartet will perform in three major European festivals in June, including Download Festival 2015 in England and the Hellfest Festival 2015 in France. More tour dates will be announced soon. 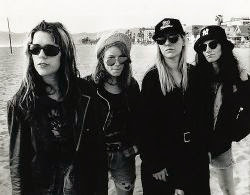 Formed in 1985, the L7 had its commercial peak in 1992 and 1993, when the grunge and alternative rock hit the mainstream. The most successful work of Los Angeles girls was "Bricks Are Heavy", their third album, which featured the hit " Pretend We're Dead" that played for the radio and especially on MTV. This success ended up bringing the band to Brazil in January 1993 to perform at the Hollywood Rock before Nirvana. By the end of the decade they launched three other albums, but none of them repeated the same success and the group ended up separating. The L7 also wants to commemorate their history on film. A campaign on Kickstarter collective funding site was started to "L7: Pretend We're Dead" can be performed. The film will be directed by award-winning documentary filmmaker Sarah Price.